Sick of your usual breakfast? Here’s a new one for you. Go to Trader Joe and buy some plain lassi and frozen mango. Cut up 2 mango slices into little pieces. Put lassi, mango and a scoop of protein powder in the blender and whip it up. Dee-lish! If you don’t have Trader Joe in your area find an Indian grocery store or a fancy health food store. I have more stories for you – like the one about how my road rash got seriously infected and I’ve been on antibiotics for over 2 weeks. But I’ll save that for later. My b’fast on a busy-get-out-the-door-post workout is ALSO kinda from T. Joes. 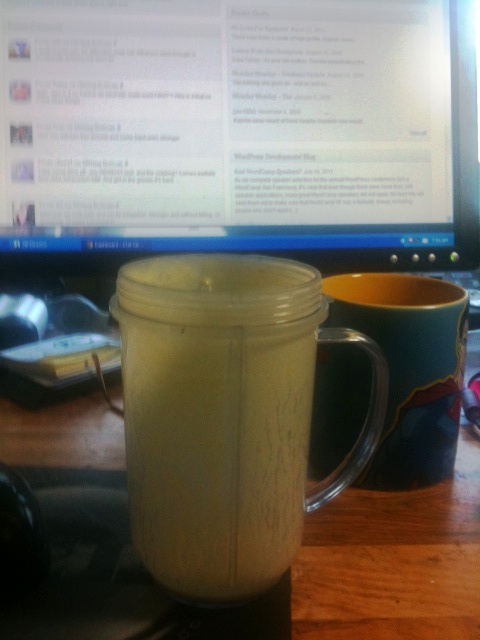 Vanilla Whey powder, banana, handful of blueberries, cup of OJ and a hunk of silken TOFU! I love peaches and mango in a smoothie too! Sorry to hear about the infection…heal quickly! Good luck getting rid of the infection. Mangoes have been big this summer. I have been buying them by the case as the price has been really reasonable and they have been in good shape too. Hi, I really enjoy your blog. I am the inventor of a running program for iPhone and Android called PaceMaker. Are you interested in doing a review of the application on your blog? I would give you a free version of the application and send some traffic to your site. The application is designed to solve the problem of trying to run at a specific pace. You can set a pace, like a 9 minute mile, and the application tells you to “speed up” or “slow down” while you are running. I created it myself after being frustrated that no other apps out there would help me keep pace, without my having to look down at a watch or unlock a phone. It also does the standard tracking of your runs on a map and allow you to post your run to dailymile.com. Anyway, if you are interested, please let me know. Thanks for you time, and keep it up. Your blog is great!